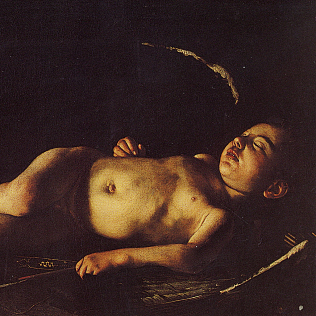 Until October 3rd, the Caravaggio\'s painting, the Sleeping Cupid, will be in Lampedusa. On the island, in fact, there is an exhibition dedicated to immigration: a new museum, the Museum of Trust has been inaugurated with this event. Along with the canvas, there are dozens of works, but also objects found after several shipwrecks. The painting, depicting the young god Eros in a moment of rest, has been chosen for the similarity with the many tragic images of children who lose their lives trying to arrive in Europe. Caravaggio\'s Cupid is just asleep, but many scholars have speculated that the model for the work was a sick child, or even a dead one. The painting, however, conveys a message of hope, because it is symbol of the love that lives within each person. Scholars also point out that Caravaggio, an artist with a very troubled life, painted this work while he was running away, forced to flee to Malta, another Mediterranean island. The Uffizi director - Eike Schmidt - accompanied the painting by Caravaggio in Lampedusa. Usually, the artwork is exposed in Palazzo Pitti. We have to remember that the Palatina Gallery is now part of the Uffizi Gallery. An important and significant loan for an exhibition and a museum demonstrating the universal character of art.